So you’d have to be living under a rock to miss the whole Daemon Invasion campaign that’s been blowing up Twitter as of late. And now we can FINALLY announce what it’s about! Woohoo! So without further ado, a note from Jen…. Don’t forget to visit Jennifer L. Armentrout’s blog to win a signed set of Half-Blood and Pure, in celebration of her adult romance release, Tempting the Best Man, under pen name J. Lynn. It can be purchased HERE. The 10 spots for Team “Got Daemon?” have been filled! Thanks y’all! Check out our awesome promo…poster thingee. It rocks… it totally rocks my socks. OH MY GOSH!!! You’re not kidding!!! 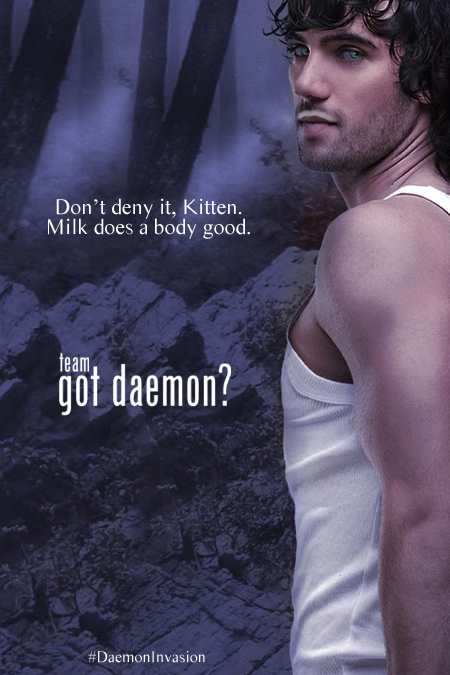 Daemon and Katy will be on tour and going to meet the readers.. I think I would faint…right now…as in now… oh my goodness! I WISH WISH WISH I COULD GO! :'< huhuhuhu… But as of now, I'm so excited and thrilled to be part of your team! Yay yay! We'll win this thing.. whatever it is lol. =D Thank you for letting me participate Dani! I'm so excited! Let's do it. I KNOW!!!!! It’s 9 hours away, but I’m 90% sure I’m going to be able to go to the Georgia signing. Omigosh, I’m just beyond excited. WOW I wish I lived in the US!! Maybe I’ll have to move there one day haha. Just to go to Jennifer Armentrout’s book signing? Now that’s true devotion 😉 Thanks for stopping by Kate! Oh my! This really will be awesome!!! Good luck! and take picture for us! lol. I wish I could live there. BTW so glad to support your team! I will take many, many pictures for y’all! so glad you’re on the team, Lis!!! LOL… I’m trying to come up with a cool idea for the team for the signing. Don’t worry, I’ll make sure you guys are included in some way! Maybe I do live under a rock. How haven’t I come across this series and the Daemon Invasion before? I just looked up the reviews for this and the main character is a book blogger? What? I am fangirling already and I think I might be able to go to the signing on the 13th. oh em gee. Signings never happen in Orlando, well the ones I want to go to anyway, lol. LOL… well, it’s good to know that I’ve at least managed to avoid annoying one person to death with all my Daemon-esque tweeting the last few days. WHOO MAMA can you get any hotter!! !